While the new headlines are all about Hurricanes, health care, North Korea and tax “reform,” chickens around the country are getting more and more nervous as the foxes quietly move into the government agencies that are supposed to be protecting them. 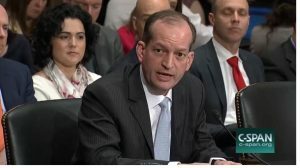 Over at the Labor Department, Justin Miller in the American Prospect writes about how Labor Secretary Alex Acosta’s appointees all have one thing in common: A long history of representing business interests over workers. Pat Pizzella, who, along with Jack Abramoff, defended worker abuse in the Northern Mariana Islands, is slated to be Deputy Secretary, the number two position at Labor. We’ve already written about retired coal company executive David Zatezalo, Trump’s nominee to head MSHA. And then there’s Cheryl Stanton, the department’s nominee for Wage and Hour administrator, which enforces the nation’s minimum wage, overtime, and other core employment laws. She currently is the head of the South Carolina Department of Employment and Workforce, and previously defended companies over workers while at the law firm Ogletree Deakins. These are bad enough in and of themselves, but Zatezalo and Stanton replace Joe Main and David Weil, both widely recognized as some of the strongest and most innovative leaders in the history of their respective agencies. Meanwhile, a few blocks up Constitution Ave at the Environmental Protection Agency, Trump’s pick to head the agency’s lead air and radiation policy,William Wehrum, will be spending next week arguing on behalf of industry groups in a federal court of appeals against OSHA’s silica standard. An EPA spokesperson saw nothing wrong with Wehrum’s work next week. After all, the silica lawsuit is all about taking away protections from workers inhaling a cancer causing dust, while his work at EPA will be about rolling back rules on carbon dioxide emissions from power plants and ozone pollution. OK then…. 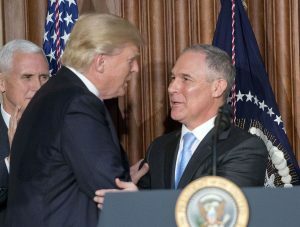 And just when you thought things couldn’t get worse, EPA’s chief Scott Pruitt has nominated industry flack Michael L. Dourson to head the agency’s Office of Chemical Safety and Pollution Prevention, “at a time when the E.P.A. is in the early stages of putting in place Congress’s 2016 overhaul of the law governing toxic chemicals.” Why is this of concern? Dourson ran a consulting firm that represented the American Chemistry Council and many of the nation’s largest chemical companies whose products have been shown to cause severe health issues, like cancer, birth defects and developmental problems in children. Meanwhile Pruitt is apparently so popular with those of us who have to live on earth, breathe air and drink water, that the agency is being forced to pull environmental law enforcement personnel off of their regular jobs of prosecuting environmental crimes to provide him with round-the-clock security protection. His security detail is triple the size of Obama’s two EPA administrators. OK, if you’ve read this far, you deserve some good news as a reward. And especially good news for construction workers who have a much better chance of living to retirement thanks to the Obama administration’s silica standard. OSHA is scheduled to start enforcing its construction silica standard on September 23. Yes, that’s the same silica standard mentioned above that will see its day in court next Tuesday. (The Department of Labor, by the way, is defending the standard in court.) Enforcement was supposed to begin last June, but the Department delayed the enforcement date by 90 days. At equipment manufacturer Bosch Power Tools, the company’s director of strategic development, Jim Bohn, said he can measure interest in the rule by tracking purchases of tools and attachments designed to prevent silica exposure. So lots of people can literally breathe easier now.